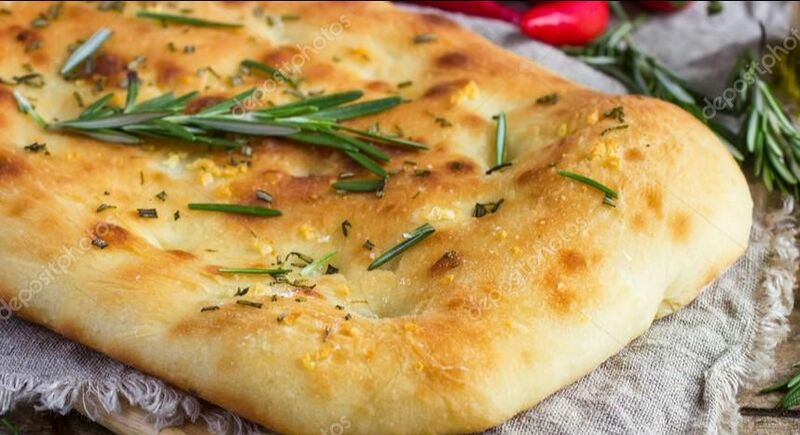 Focaccia is an olive oil-rich Italian bread, crisp on top and bottom but fluffy inside with abundant air holes of all sizes. The brining which is recommended by many chefs gives it a moist mouth feel. Yes, you'll need to use yeast and let it rise overnight, but it's as easy a recipe as they come. Mix together 2-1/2 cups water, honey and yeast in a bowl. If using sugar add to dry mix. Whisk flour and salt in a large bowl. Add yeast mixture and olive oil to flour and salt. Mix with a wooden spoon or spatula. Once completely mixed, cover with plastic wrap and leave in fridge until doubled in size (overnight). The next day, using a rimmed baking sheet, grease the pan with 2-3 tbsp olive oil. Remove dough from the bowl and fold it gently. Transfer to pan, drizzling with 2 tbsp oil. Gently stretch and spread dough to sides and corners. To prevent shrinkage let stand for a few minutes and then continue stretching dough to the edges of the pan. To create focaccia's famous dimples, press the tips of your fingers into the dough. Next is many chefs secret ingredient: a salt and water brine. Whisk together warm water with 1 tsp salt. Pour the mixture over the dough, filling dimpled areas, too. Then let the dough rise for another hour. While waiting preheat oven to 450 degrees. Before placing in the oven sprinkle more salt. Place the focaccia on a middle rack and bake for 30 minutes or until the bottom is crisp. Then move to top rack for 5 minutes. This is necessary since the brine prevents a golden top crust from forming while baking on the middle rack. Remove from oven then drizzle at least 3 to 4 tbsp olive oil across entire surface of focaccia. Let sit until cooled then transfer to wire rack. If you're using the focaccia later, simple wrap tightly in plastic wrap and place in fridge. You can reheat if you wish before serving.